Ousmane Dembele's rumour of a transfer to Arsenal is getting stronger day by day. He would certainly be a great addition to the squad and there is no reason why Emery wouldn't want him at Arsenal. But one question that always revolves around my mind is that why would he wish to come to Arsenal, leaving the best club in the world? 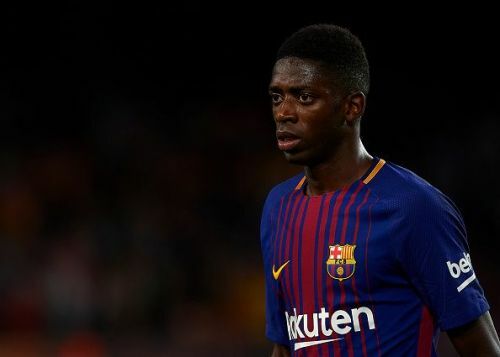 Recently, the links have got even stronger as The Sun reports that Barcelona are eyeing a swap deal for Dembele. This can be true as Segura is against the signing of Thiago for Ramsey's style of play matches with Barcelona. Barcelona are in search of a midfielder and Ramsey won't be a bad choice at all. Arsenal are looking for an out-and-out winger since the start of the transfer window, and they were also linked to Coman. But the Bayern winger seems likely to stay, as he is seen as the successor to Ribery. With the signing of Malcom, Dembele sure must have felt irritated and according to Sport, Dembele's representatives have informed the club about their discomfort at the signing of Malcom, who has similar characteristics as the Frenchman. Emery made some early signings and has done pretty well in the transfer market, signing players, who were needed by the club -- Sokratis, Torreira, and Lichsteiner. Arsenal required a midfielder who could bring the balance and stability in the midfield, and Torreira is a great choice. He provides a high work rate and is a dead-ball specialist. Sokratis and Lichtsteiner, on the other hand, are great additions to the squad after Arsenal suffered on the defending aspect, conceding nearly 100 goals in just the past two seasons. However, this year Arsenal look to be more stable and strong, because Emery has done good business with the squad. He has made the required changes and is not ruling out any more transfers. Dembele will likely join on-loan, as Arsenal won't be able to afford his transfer fees and salary. But the point of this article is to explain why Dembele should choose Arsenal out of all the top European clubs, despite the fact that he would miss out on Champions League football this year. Barcelona lately hijacked the deal from Roma for former Bordeaux player, Malcom. Roma had confirmed that they had agreed to a deal with Bordeaux for Malcom for a fee of €36 million. But the late interest from Barca made Bordeaux change their minds as the Catalan side were offering €41 million plus add-ons, and therefore Malcom didn't travel to Roma for his medical. Malcom possesses similar characteristics to Dembele. They are both right wingers, can also play on the left, and are left-footed players as well. Dembele must be disappointed by the signing of Malcom, but the sole reason for signing Malcom will be better depth. The latter has been performing quite well in the pre-season games, whereas Dembele is enjoying his vacations. Malcom's arrival is a serious threat to Dembele's starting position and this could lead to not getting enough game time, which was the same case for Dembele last season. Two years without playing as a starter, including the 2018-19 season, could eventually get him further down the pecking order for Euro 2020.